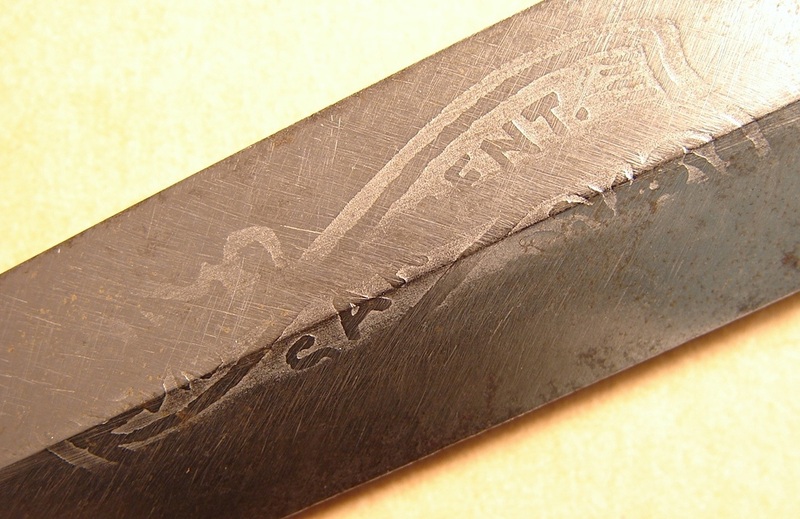 This page is dedicated to knives that have been etched with the owners name and/or unit. 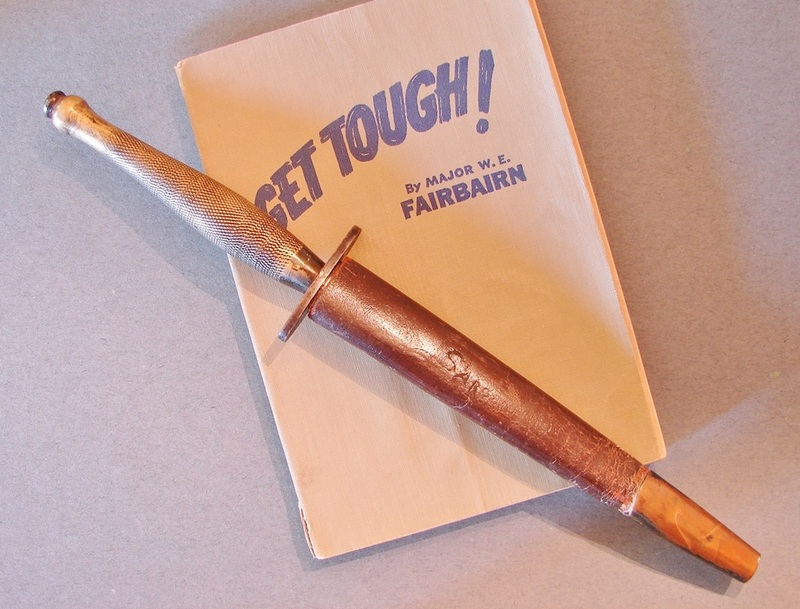 This was a service offered by Wilkinson Sword Company for knives bought through their Pall Mall Street store. There are various scroll designs displayed. It is quite obvious by the names of the troopers involved they were not all British or American, signifying the global involvement of the Allied Forces. You will note that one of them is etched with the name Decker. As far as I know he was no relation to me. Attempts to track down the names are almost always futile. The names of men who fought and died for freedom are legion, those named and those un-named. Below: Theater modified Wilkinson Second Pattern with handle made from plexiglas washers and capped with an aluminum pommel and 1942 British Shilling coin. The coin is attached off-center, unfortunately, some of the washers are loose too. It is named to Ted Vlachos a lieutenant. "Ted was a WWII Veteran and specialist with Naval Intelligence and was awarded the British Empire Medal for his outstanding contributions. He later served as Commanding Officer for the local Sea Cadets Corps." 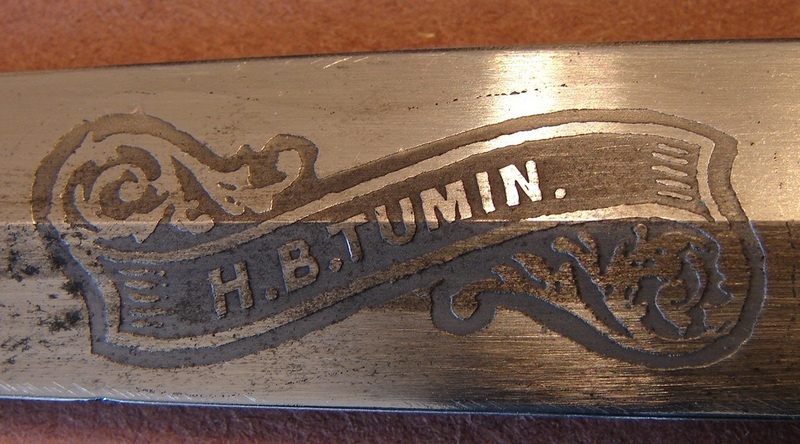 Below: A fine button hilt Wilkinson knife once owned by Sgt. R.S. Davey. I have discovered this much so far. Air/Gnr: Sgt. R.S. Davey 1303262 R.A.F.V.R. 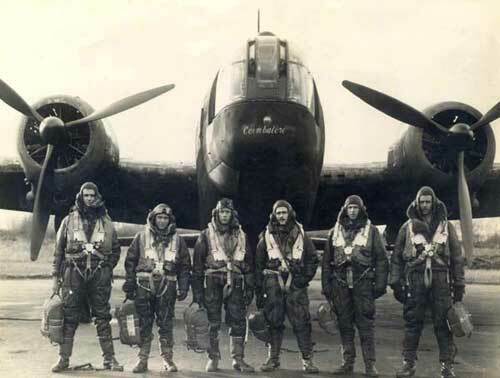 His aircraft, a Wellington Bomber, was shot down over Bremen, Date: 13/14th September 1942. He was interned in a German POW camp Stalag Lamsdorf. Please email me if you find anything of record. 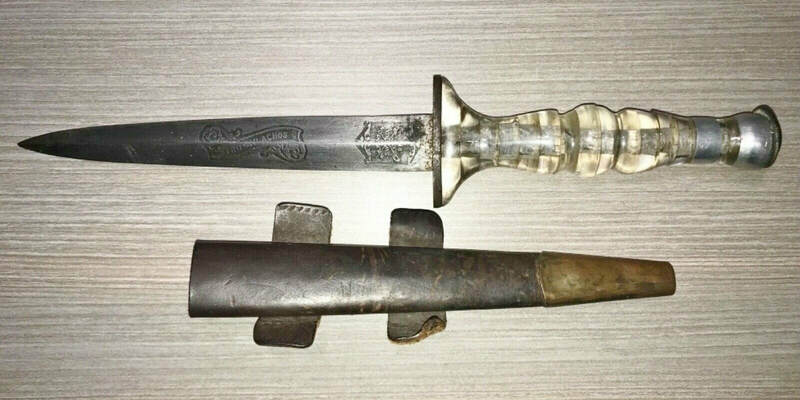 The knife came out of a shop in Maine but how it got there is also unknown. 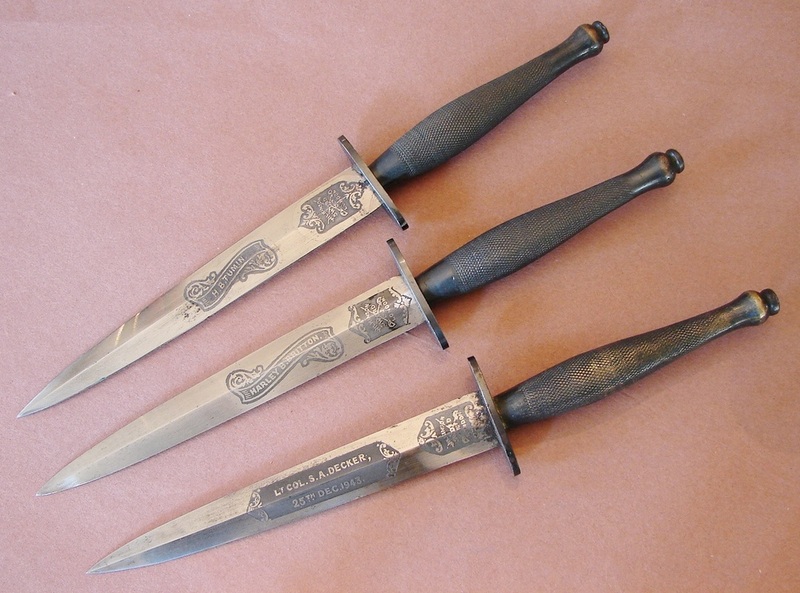 Below: Two really nice Wilkinson knives etched with the names of Harry Harding and Charles Barrett. I bought the pair of these from one man but he did not know anything of the original owners. Time and neglect took a heavy toll on this next blade. 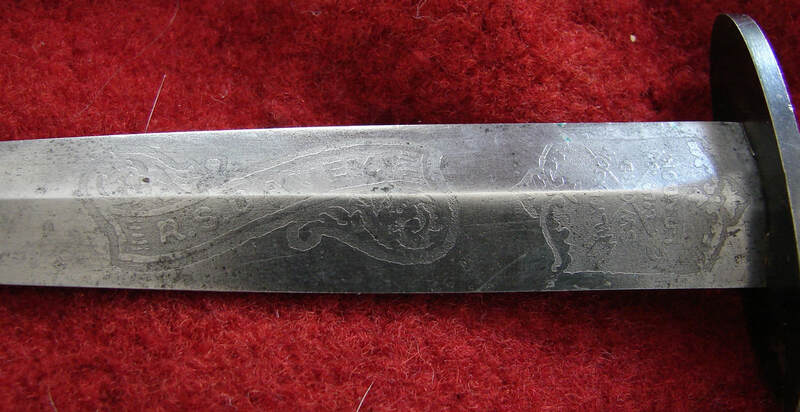 Only with very close scrutiny can the owners name be made out in the etched scroll. The F-S and Wilkinson logos are nearly gone as well. 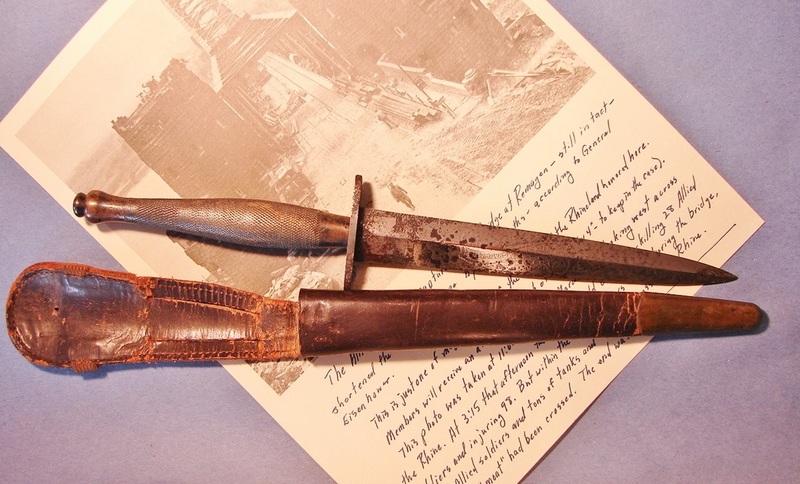 This knife belonged to a Col. G. P. Grabfield. 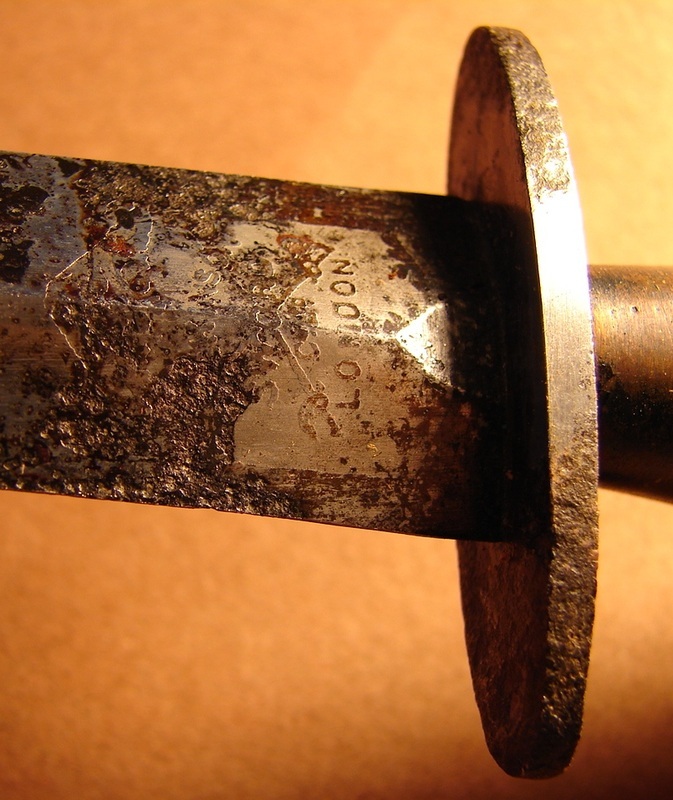 "Named Knives" command a 50% premium, or more in some instances, but not when they are in this poor condition. If only there were a way to go back in time and prevent this damage from occurring. Perhaps it was stored in a damp place, or put away wet. It might have even been lovingly oiled and stored away for too long without attention. For those of you new to the collecting field let this be a warning to constantly monitor your knives for corrosion. Be careful what you store them in and what protective products you use on the blades and sheaths. Some oils actually contain a lot of water. 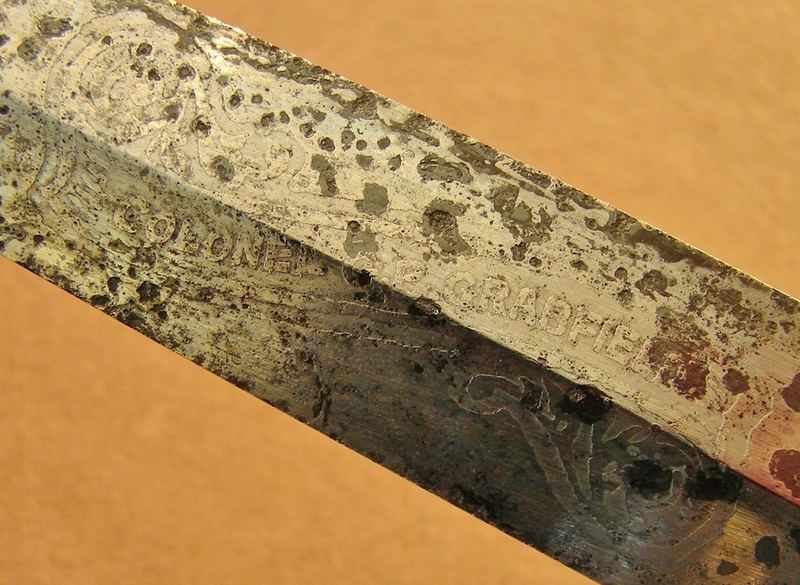 The front part of the scroll has been wiped away by the owner sharpening the blade. He did an excellent job and this is one of the sharpest original WW-II F~S in my collection. Luckily the entire scroll was not removed. 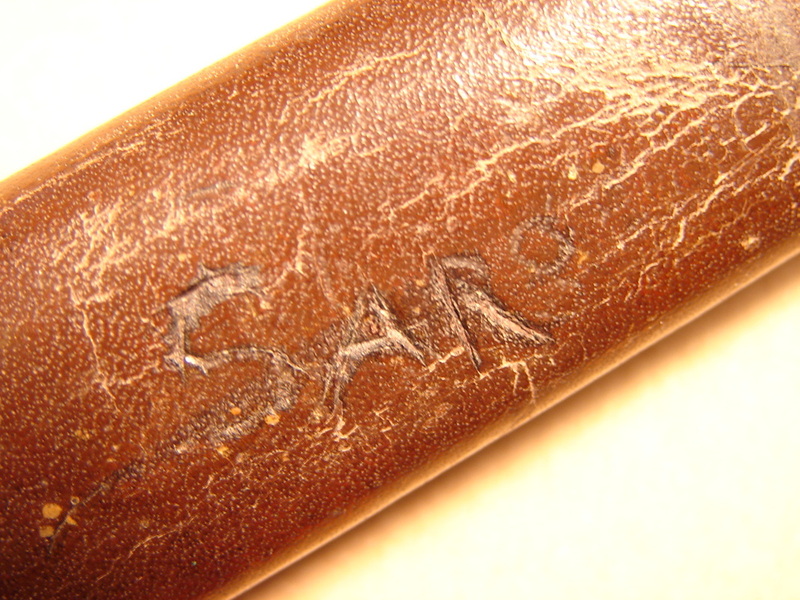 Note the incomplete name of Sargent (Sarg..) cut into the sheath, leaving very little doubt that this knife and sheath have been together for a long time. A fine specimen originally belonging to Marion Del Buono. The handle has been replaced by one having what may be an aluminum ferrule and pommel fitted with a series of plexiglass washers in the center. Interestingly, this did not ruin the balance of the knife and it has a rather pleasant feel. 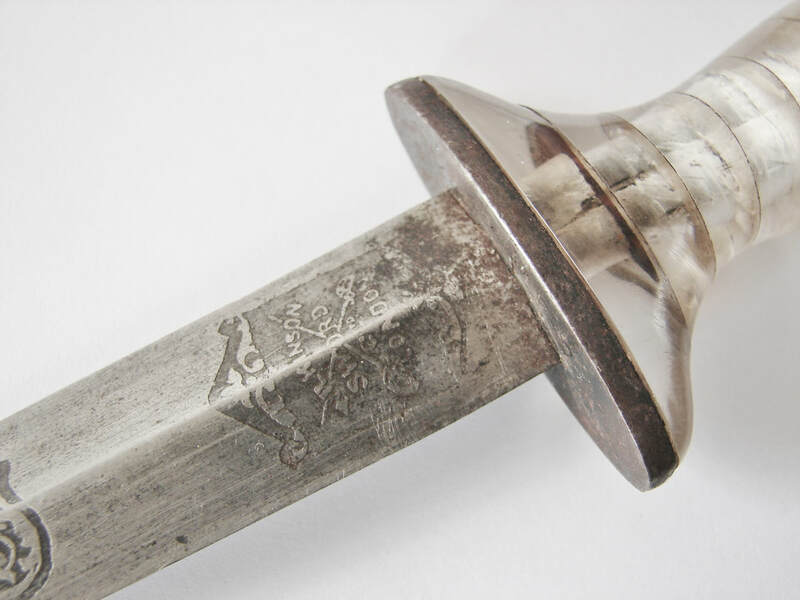 The pommel is held in place by a brass nut of sorts. The blade is in mint condition wth only slight fingerprint stains. 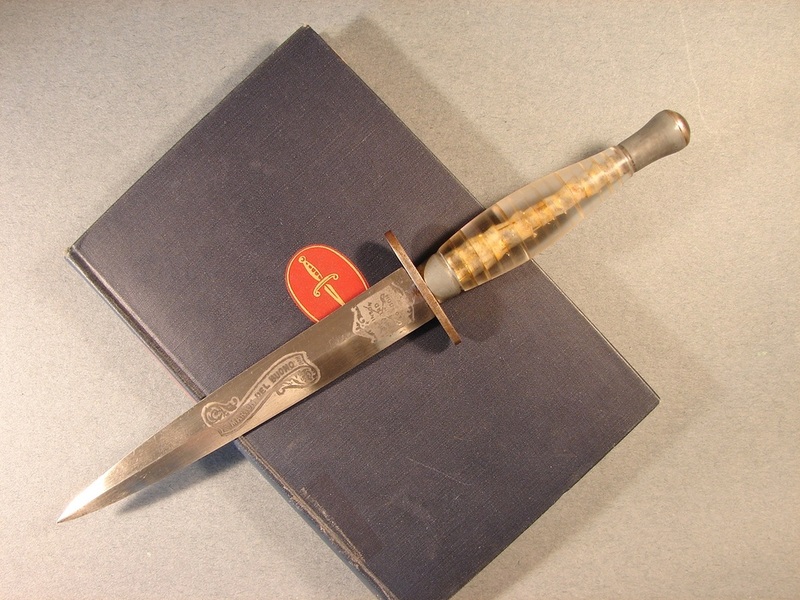 While a knife like this is shunned by many collectors and remarks about the desecration of a fine collectible knife abound, remember these knives were made for men to use to kill men. They were never intended to be wall hangers or "collectable." If knives could talk, would we want to hear their stories? I wonder. In WW-II plexiglass was considered a new-age material and provided a warm gripping surface as opposed to the standard turned brass one. It also allowed the owner to personalize his knife. The workmanship is much finer than normal for field modified knives. You can clearly see the tang of the blade through the translucent plexiglass. 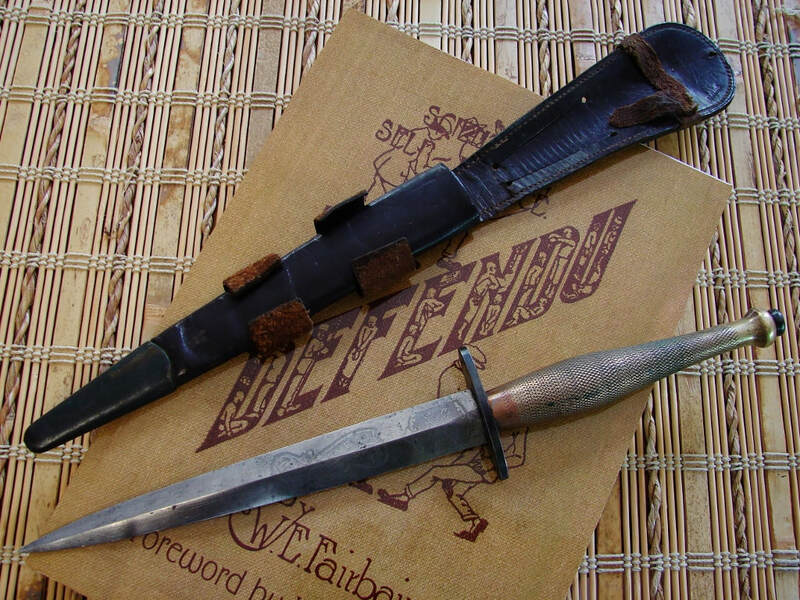 Below: Col G. B, Grabfield's knife is shown here in this full length photo. The pitting is obvious and lamentable. The sheath is quite fragile too.